It’s Spain, it’s June but somebody forgot to tell the weather. We’ve had a decidedly dodgy start to spring and summer – average temperatures in May were 3 degrees colder than in the last three decades and average rainfall was up by 50 litres per square metre! As a result my garden is in a sorry state. I have planted very little; with so much rain finding the right time to dig has been difficult, and what I have planted is not doing so well. With so little sun nothing is really flourishing as you would expect at this time of year. Climbing too has been curtailed and our usual escape clause in times of bad weather of jumping in the van and heading off for a few days has not been an option as the bad weather hasn’t just been confined to our mountainous corner of northern Spain but has, most unusually, squatted over vast swathes of the country. It’s also slowly dawned on me that we have become so accustomed to the (normal) Spanish weather that we have lost some of our capacity to cope in bad weather. Now we see bad weather as a reason to withdraw inside, batten down the hatches and sit it out. Plus our barometer for what is ‘bad’ weather has been reset to a considerably lower baseline. Drizzle that might be termed a ‘soft day, thank God’ in the west of Ireland is now enough to stop us dead in our tracks. We wrap ourselves in fleeces on days that would be worthy of bikinis back in the UK. I think we may have gone a little soft. 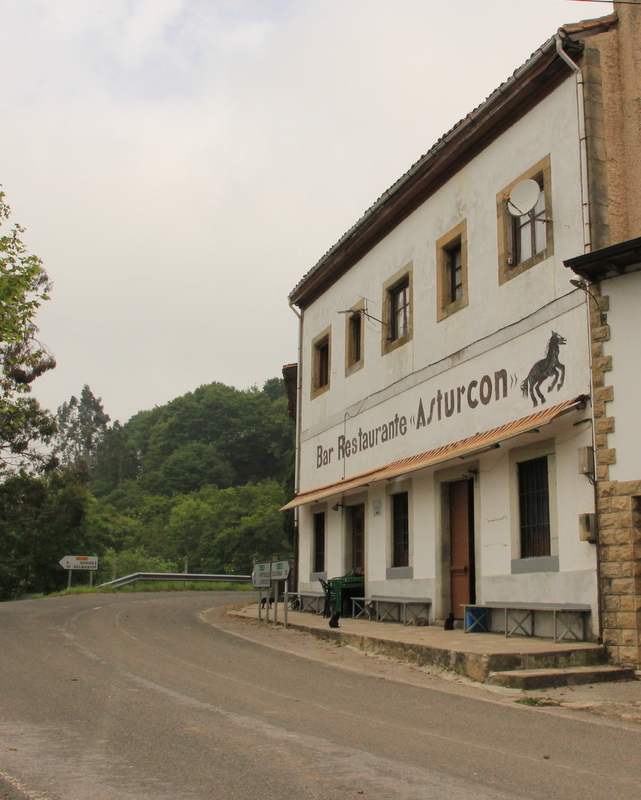 Bar-Restaurante el Asturcón, Alto La Llama. The start point for our hike up the Sueve. They do great pinchos and full menús here. We set off from Alto de la Llama in a dank, dismal mist. With the Sueve being so close to the sea the views from here as you gain height are usually spectacular, with panoramas along the coastline as well as to the higher mountains of the Picos de Europa to the east and the Cordillera Cantábrica to the west. On Thursday as we set off we could barely see the path ahead. Luckily it’s a very clear wide track so even in the mist there was no risk of getting lost and wandering off a cliff edge. 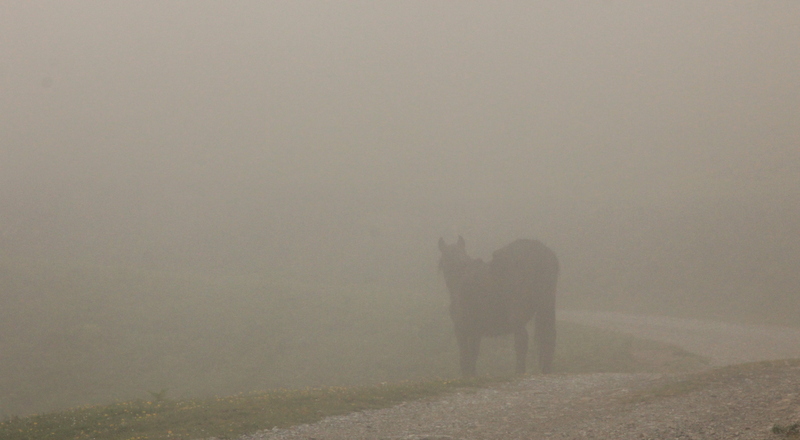 We did almost stumble across a few wild horses in the mist however. 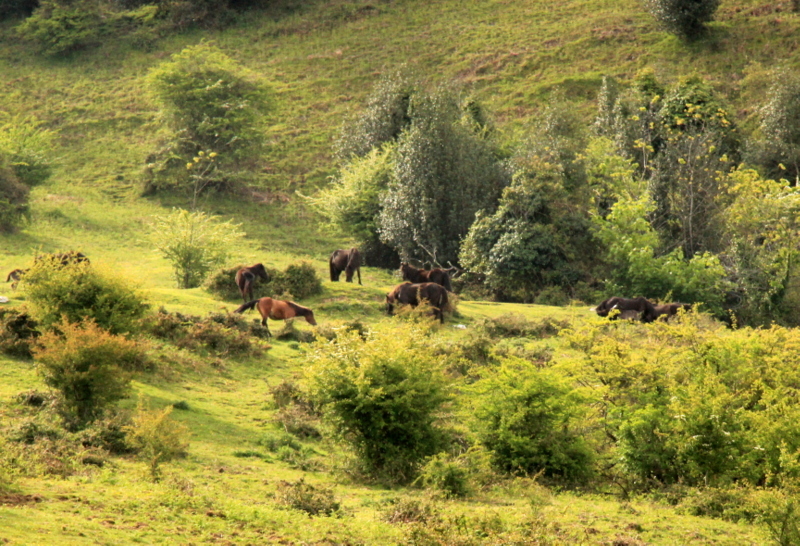 The Sueve is home to a large population of the native wild pony, the asturcón and, whatever the weather, you will always be guaranteed sightings of herds of these sturdy animals on its hillsides. As we headed onwards and upwards we were rewarded with a few breaks in the cloud that allowed us to see just how many of these ponies there were around us. A lovely sight, especially given the fact that they have historically been threatened by extinction. Once we had gained enough height we actually emerged fully above the cloud that wrapped the coast and had clear views around us. That’s some bank of cloud. Much more attractive from above than from below. Are those some mountains I spy in the distance? Now we were able to sight several roe deer, another plentiful inhabitant of this sierra but considerably harder to photograph as these skittish creatures don’t tend to hang around long enough for the slow-reacting photographer to extract her camera from its bag and remove the lens cap. 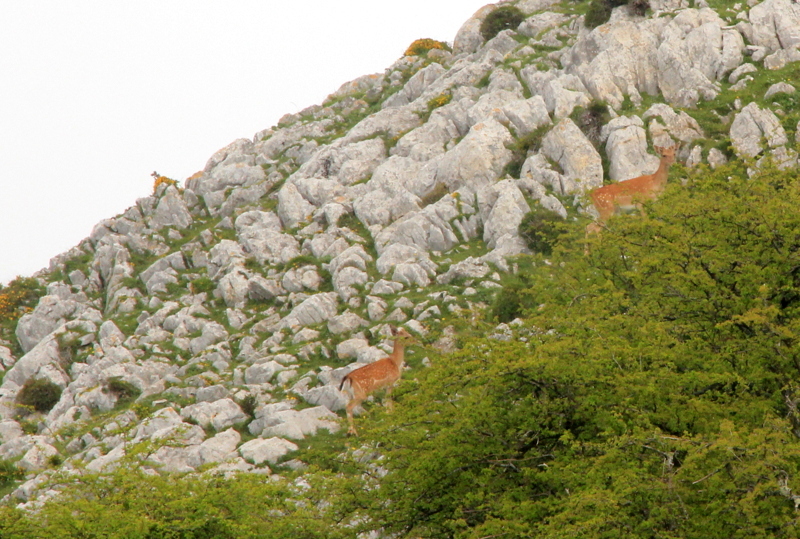 Here are a pair I managed to snap in the distance as they skittered away from us up a rockface. We didn’t make it all the way to the top; it was a school day and I had to be home by 1pm so we had to conclude the ‘gardening meeting’ early. Which was lucky as we made it back just before the promised thunder storm broke and it really was time to retreat indoors and batten down the hatches. You are absolutely right – we’ve gone soft as well – used to spending most days outside since being here, a bit of drizzle, a cool wind or dark low clouds and we retreat. We occasionally have to remind ourselves about the days we spent walking in torrential rain, snow, ice, hail etc back in the UK… Lovely area the Sueve and a favourite of ours as well. Thanks for reading Ian. And I’m glad to hear I’m not the only one who has gone soft! We’re so lucky to have the Sueve on our doorsteps. I love the walking adventures you go on – that bank of cloud is amazing. Hope the weather is perking up for a bit now? X.
Don`t want to sound like a smart guy, but I think what you actually saw were fallow deer, some of them were released in the Sueve mountains back in the 50s and now there are lots of them. As to the weather, this is how I remember it before global warming came! Oh thanks for that, I was unsure and relying on Wikipedia for my information! Beautiful place! I can imagine why you’ve traded life in the UK for this. I would do the same.